This article will describe how to use the toms and snare drum from your drum set as a substitute for timpani when practicing at home. If your school or orchestra can not accommodate your timpani practice schedule, practicing at home can be a life saver. Practicing timpani music on drum set will have limitations. 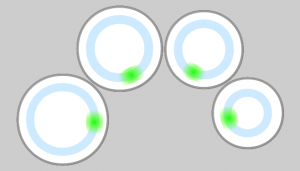 The chart shows which timpani techniques can be practiced on drum set drums. With any drum setup, drummers will have preferences for how the drums are positioned to be the most comfortable for playing. Position, height, and slant will vary. As an experienced timpanist and drum teacher, I will describe the drum positioning that should allow students to play timpani effectively. The 36″ width is suggested for a six-foot tall drummer. Drummers of different heights should adjust accordingly. Note: Timpani are not played in the center of the drum head. Timpani are played near the edge, about 3″ – 6″ from the rim. The playing zone is shown in blue. Keep the drums spread apart to simulate the distance between timpani. When using drum set to practice timpani, the timpani music will dictate the placement of the toms and snare drum. It is useful to have an opportunity to play through the timpani part on timpani before practicing extensively on timpani substitutes, however this is not essential. The timpani music may contain rhythms between two drums that requires playing side-by-side instead of playing out front. 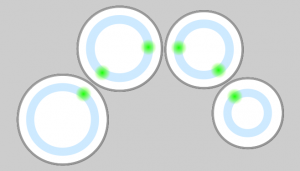 As you position your drum set as a timpani substitute, remember that the goal is to arrange the drums to simulate actual timpani as closely as possible. Following are the things you should consider when arranging your drums for practice. 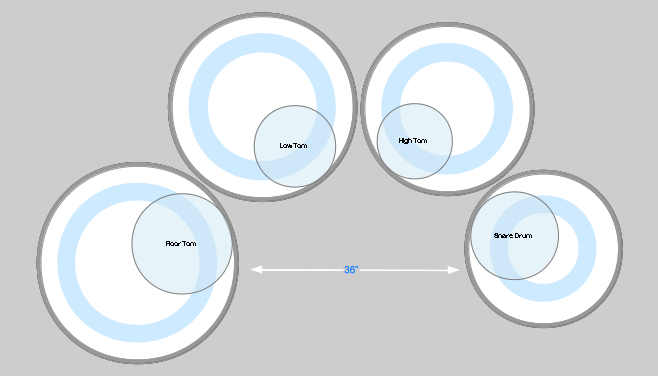 Note: While drum set toms are most commonly arranged from high to low (left to right), timpani in USA are arranged the opposite; low to high (left to right). The highest timpani is on the player’s right, while the highest tom-tom is on the player’s left. Green areas represent playing positions in the playing zone. The timpani music will dictate the appropriate playing position. Your timpani substitute setup should be arranged to accommodate the timpani music. If necessary, you can adjust the setup to practice different sections of the music. 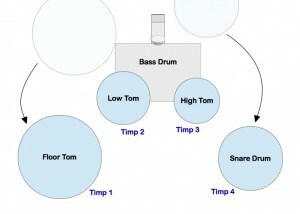 This drawing can be helpful for positioning your toms as timpani. 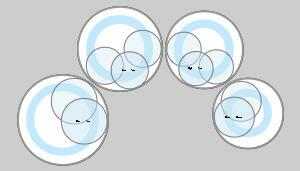 It is common for timpani parts to require multiple playing positions during a performance, sometimes playing in nearest neighbor position, and sometimes in front position. In this case, you may chose to compromise the drum position by arranging the toms between the two playing positions. 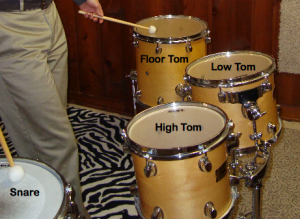 In either case, keep the toms spread apart to simulate the distance between timpani. This will help prepare you for the furthest stick-travel needed. If you don’t have a stand that will hold your toms, leave the toms mounted on the bass drum. Turn the bass drum around, or stand in front of it. Adjust the toms to the best position for timpani substitute. 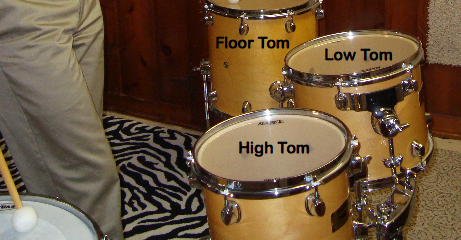 This arrangement best simulates the pitch order from low to high (left to right): floor tom, low tom, high tom, snare drum. Note: Remember, timpani rolls are played as single-stroke rolls. Practice the single-stroke roll when using toms and snare drum as timpani substitutes. Thank you for visiting. I hope you found this article about using drum set to practice timpani at home by Sheboygan Drum Instructor Jamison Stokdyk useful. This entry was posted in Drum Lessons, Drum Reference and tagged drum set, practice, practice timpani at home, practice timpani using drum set, practice timpani using toms, timpani, timpani substitue on December 12, 2012 by Sheboygan Drums.